A new and potentially skillful seasonal forecast model of tropical cyclone formation [tropical cyclogenesis (TCG)] is developed for the Australian region. The model is based on Poisson regression using the Bayesian approach. Predictor combinations are chosen using a step-by-step predictor selection. The three-predictor model based on derived indices of June–August average convective available potential energy, May–July average meridional winds at 850 hPa (V850), and July–September geopotential height at 500 hPa produces the smallest standard error (se 5 0.36) and root-mean-squared error (RMSE 5 5.20) for the leave-one-out crossvalidated TCG hindcasts over the 40-yr record between 1968/89–2007/08. The corresponding correlation coefficient between observed annual TCG totals and cross-validated model hindcasts is r 5 0.73. Using fourfold cross-validation, model hindcast skill is robust with 85% of the observed seasonal TCG totals hindcast within the model standard deviations. Seasonal TCG totals during ENSO events are typically well captured with RMSE 5 5.14 during El Nin˜ o, and RMSE 5 6.04 during La Nin˜ a years. The model is shown to be valuable in hindcasting seasonal TCG totals in the eastern Australian subregion (r 5 0.73) and also provides some skill for the western Australian region (r 5 42), while it not useful for the northern region. 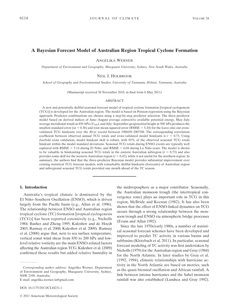 In summary, the authors find that the three-predictor Bayesian model provides substantial improvement over existing statistical TCG forecast models, with remarkably skillful hindcasts (forecasts)of Australian region AU1 and subregional seasonal TCG totals provided one month ahead of the TC season.